The KAUFMANN home inspection will help you better understand your decision to buy or not to buy a prospective home. As experienced, trained professionals, KAUFMANN CONSULTANTS have seen it all, and we'll provide valuable help in turning you into a knowledgeable consumer. We will identify potential problems so that you can more thoroughly understand the condition of the house you are buying. We will carefully document the issues raised by the inspection and provide you and your designated representatives with the report so that remedial measures can be undertaken or the issues effectively negotiated. In addition, our reports include relevant maintenance areas of concern so that preventive measures can be undertaken to avoid costly repairs. In both new and older homes, the best way to ensure that you are well informed about the strengths and weaknesses of a property is to have a KAUFMANN CONSULTANT perform a professional home inspection. The focus of a KAUFMANN CONSULTANT home inspection is the home's structure and mechanical components. Roofing, siding, windows, porches, decks, gutters, heating, cooling, foundations, electrical and plumbing are inspected. See "PRELIMINARY INSPECTION REPORT" for details. This checklist has been developed as an outline for the inspector to follow. A copy of the outline will be provided to you upon completion of the inspection. "Flipping" houses is a common occurance in New Jersey. This is when a speculator purchases a house and does cosmetic repairs to make the house look new. Sometimes, serious defects are present and not addressed by the seller. Our extensive construction background gives us special insight into areas of concern that a thin coat of paint may conceal. KAUFMANN CONSULTANTS are experienced and trained to identify problem areas both small and large that may have been overlooked by the previous owners and to identify which defects require immediate attention. See our Inspection Overview for more details. The quality of present-day construction is often not what it used to be some years ago; therefore, many buyers have independent reviews of their properties during various stages of the construction process, including slab, frame, and final inspection. You will likely be surprised at the number of minor and major defects discovered by KAUFMANN CONSULTANTS while inspecting a NEW home. Defects encountered during various phases of construction are thoughtfully explained to the client and the builder so corrections can be made in a timely manner and the purchaser/inspector and builder relationship is maintained through effective communication. This relatively inexpensive inspection protects your purchase, prevents unpleasant surprises, and ensures the quality home that you’ve dreamed about. Some builders provide a one-year warranty for new construction. During this period of time, the buyer may develop a "punch list" of corrections for the builder to repair under the warranty coverage. Some defects will not be obvious to the untrained eye. It is prudent to obtainKAUFMANN CONSULTANTS inspection services to help compile the "punch list" of defects that can be presented to the builder. You will be reassured knowing that potential problems were addressed before they grew into something that could cost you a great deal down the road. New Jersey also requires new home builders to provide a ten year warranty program against significant defects. Carefully review the details of the insurance/warranty program before purchasing the home. KAUFMANN CONSULTANTS have served as expert witnesses in New Jersey legal matters, and provided reports and testimony for judges, attorneys, and insurance companies in state court trials and arbitrations. Our testimony focuses on structural soundness, conformity to standards, possible defects in construction or workmanship, and other hazards. 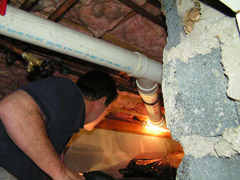 During the home inspection process, it is common for the inspector to encounter known or suspected health or environmental hazards. KAUFMANN CONSULTANTS are not experts is these fields. We do, however routinely alert prospective home-buyers when we suspect some problem area exists and we will make recommendations for follow-up inspection work by specialists in the environmental and health fields. See our Environmental Hazards page for more information. If there is some concern regarding health or environmental issues, consult experts in these areas. Radon: Radon is a naturally occurring radioactive gas found in soils, rock, and water throughout the U.S. Radon is a threat to health because it tends to collect in homes, sometimes at very high concentrations. See Radon FAQ. Termites and other wood-destroying organisms: These pests cause serious damage to wooden structures and posts and can also attack stored food, household furniture, and books. See Termite Facts.